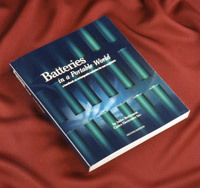 A paperback book of Batteries in a Portable World can be purchased on this site. The 300-page book is easy and entertaining to read; it makes minimal use of technical jargon. understanding this marvelous power source, the battery. Print the order form and mail or fax it to us. If faxed, payment must be made by credit card. If mailed, you can alternatively pay by check. Coming soon: Fill out and send our secure on-line order form. Payment by credit card is required.